After a brief interlude in July, when the program consisted of newly incoming King Lion Julie Thomas laying out her vision for her year, we are back to our regularly scheduled programs from community members. This month, we heard from Rick Potocek, a former special agent with the FBI and currently a Forensic Accountant for a private firm. 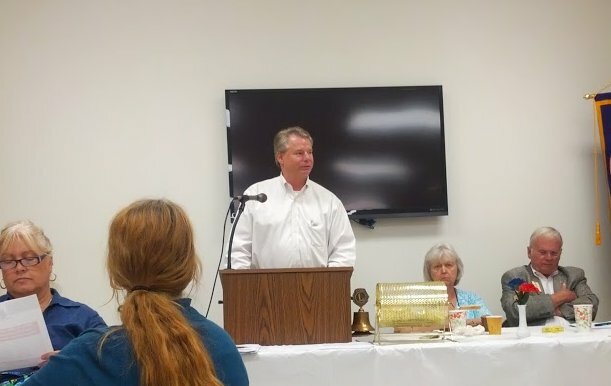 Rick spoke to us about his involvement in an organization called Crime Solvers of Montgomery County. Crime Solvers, also known as Crime Stoppers in some areas, is a community service organization that works with the police, civic, and business organizations to offer rewards for anonymous tips that lead to the successful solution to local criminal cases. They fund these rewards through private donations from local community members and businesses. Rick told us about two cases where Crime Solvers of Montgomery County successfully led to arrests. The first was a bank robbery in Colesville and the second was an armored car robbery in Rockville. He also gave us a good deal of information about the history of the organization and how to support it. If you are interested in making a donation to Crime Solvers of Montgomery County, you can do so here.